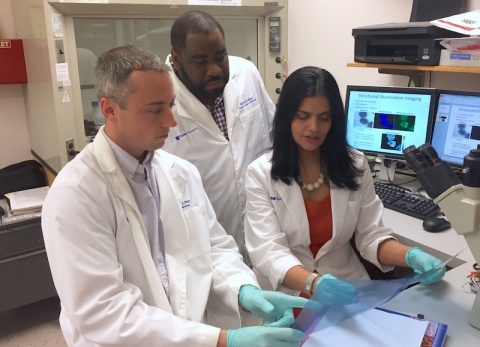 Gayathri Devi, PhD, associate professor of surgery and pathology and Duke Cancer Institute member, has been awarded $1,192,441 from the Department of Defense Breast Cancer Research Program (CDMP-BCRP) to study breast cancer metastasis. Devi’s winning project is called “Characterization of the tumor immunobiological factors that promote lymphovascular invasion and dissemination in locally advanced breast cancer." The type of award she received — a Level 2 Breakthrough Award— funds projects that are already supported by preliminary data with the potential to make significant advancements in clinical translation. Devi’s research focuses on elucidating the signaling pathways that regulate the ability of cells to adapt and survive during cellular stress. Previous studies in the Devi Laboratory have identified the role of an adaptive stress response signature in advanced breast cancer patients dominated by anti-apoptotic signaling and NFkB transcriptional activity, which correlated with clonal outgrowth of cell death–resistant cancer cells and suppressed anti-cancer immune responses. The DoD Breakthrough Award will allow Devi and her collaborators to uncover tumor immune mechanisms associated with lymphovascular invasion and dissemination in patients with locally advanced breast cancer (LABC) and inflammatory breast cancer (IBC). Devi’s team will collaborate with clinical colleagues E. Shelley Hwang, MD, MPH, Chief of Breast Surgery, Division of Advanced Oncologic and Gastrointestinal Surgery; pathologist Shannon McCall, MD, for patient biospecimen collection; and Michael Morse, MD, to develop novel co-culture assays to study tumor immunobiological factors. Other collaborators include radiation oncologists Mark Dewhirst, DVM, PhD, and Greg Palmer, PhD, as part of the DCI Optical Molecular Imaging and Analysis Core, and Kent Weinhold, PhD, Chief of Surgical Sciences, at the Duke Immune Profiling Core. Patricia Spears at the Alliance for Clinical Trials in Oncology will collaborate on patient advocacy and outreach. Many other organizations, including the American Cancer Society, support important cancer research at Duke. In fact, the American Cancer Society, which will host it's 2017 Making Strides Against Breast Cancer walk on Saturday, Oct. 14, currently funds more than $9 million in research grants at Duke. To learn more about the walk or to join the DCI team, go to Team Duke Cancer Institute.